The LNER Class D40 was made up of the Great North of Scotland Railway (GNSR) Class V and Class F locomotives. Class V consisted of thirteen saturated locomotives built between 1899 and 1915, whilst Class F consisted of eight similar but superheated engines built in 1920-1. They represented the final development of the GNSR 4-4-0 locomotives which were first introduced in 1862. In October 1898, Pickersgill recommended that the GNSR purchase twelve engines to handle increasing traffic. This resulted in an order being placed with Neilson Reid & Co in November 1898 for ten locomotives similar to the earlier Class T (LNER D41) locomotives. Five were delivered in 1899 before the GNSR cancelled the remaining order due to financial difficulties and falling traffic. Neilson & Reid sold the remaining five engines to the South East & Chatham Railway (SE&CR) who actually paid a premium for these engines (£3,300 each, compared to GNSR's £2,975). The SE&CR found the Class V engines matched their needs well, and attempted to purchase the remaining five engines from the GNSR. The GNSR declined, despite being offered £3,325 per engine. Pickersgill followed the original five Class V engines with two further renewal programs. He recommended the purchase of ten more engines in June 1903, which resulted in the purchase of four in December 1906. In March 1911 he recommended the purchase of eight more, but only four were ordered. Both of these latter batches were built at Inverurie. After World War 1, the GNSR needed further 4-4-0s to replace aging stock that was due for withdrawal. Heywood had succeeded Pickersgill in 1914, and he designed a superheated version of the Class V to meet this need. The eight Class F locomotives were delivered as two batches in 1920 and 1921. The first batch of six engines was built by the North British Locomotive Co. the second batch of two engines was built at Inverurie. Over time, various detail differences between the two classes converged, but the saturated Class V engines never received superheated boilers. 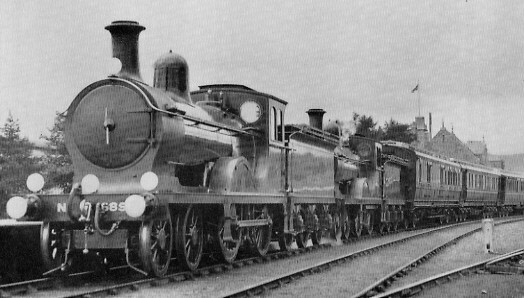 The LNER classified both the Class V and Class F engines as D40, but strangely never distinguished between the two types with a sub-classification. The saturated boilers were identical to those used on the D41s and G10 0-4-4Ts. The first replacement boilers were built in 1916, and three of the saturated D40s received new boilers before Grouping (1923). Boiler exchanges started in 1918. These boiler exchanges eventually led to two of the superheated D40s receiving saturated boilers for short periods of time (No. 6847 in 1925-8, and No. 2276 from 1946-7). The reverse never occurred. Burning of the smokebox doors due to air leakages, led to the LNER replacing the original GNSR smokebox doors with North British Railway (NBR) smokebox doors, shortly after Grouping (1923). With falling levels of maintenance, the NBR smokebox doors also started to show some signs of burning. As an experiment to fix this by reducing the blast, five D40s and five D41s had lengthened smokeboxes fitted between 1928 and 1930. These longer smokeboxes were identical to those already fitted to the superheated D40s. The experiment was not successful, and three of the D40s reverted back to short smokeboxes. Two of the saturated D40s that were not involved in the experiment, later acquired the longer smokebox design. The GNSR used the D40s for the most import express passenger services until it ceased to exist with Grouping (1923). This was because the D40s were the last 4-4-0s built by the GNSR, and unlike other companies they were never superceded by larger 4-4-2 Atlantics or 4-6-0s. During this period, they usually worked the line from Aberdeen to Keith and Elgin, although they were sometimes used on through workings to Inverness via the Highland Railway The Highland Railway was short of locomotives during World War 1, so it preferred to pay an allowance to the GNSR instead of operating reciprocal services. Although the D40s were the GNSR's best express passenger locomotives, they also had to take their share of goods and branch line workings alongside the other GNSR 4-4-0 classes. The D40s continued these express passenger duties after Grouping (1923), but they were joined by ex-NBR D31s in 1925. In 1931, they were finally displaced from the heaviest passenger services by transfers of B12 4-6-0s from East Anglia. By this time, the D40s were usually allocated at Kittybrewster, although there usually small allocations at Keith and/or Elgin. These latter allocations were usually used on the Aberdeen to Elgin main line, as well as the Buchan section, Deeside line, Speyside, and Lossiemouth branches. The GNSR served Balmoral Castle via its Balleter terminus on the Deeside line. The reigning monarch usually visited Balmoral at least once a year, and the GNSR usually used double-headed D40s for the Royal train. Lighter messenger trains were usually hauled by the older D41. Of course the engines on Royal duty were kept extremely clean, but it should also be noted that the GNSR's high standard of cleanliness for regular locomotives was maintained until at least World War 2. During the 1930s, the LNER kept a number of locomotives at the Ferryhill LMS shed in Aberdeen for southbound traffic. Resources were often short during busy periods, so a D40 would often be borrowed from Kittybrewster for pilot duties. NBR custom was to attach the assisting locomotive directly to the train. This resulted in the odd sight of a small-looking D40 being sandwiched between a much larger C11 Atlantic and the large bow-ended carriages. As the numbers of B12s increased on the GNSR section, the D40s were increasingly relegated to branch line duties. Withdrawals started in March 1946, but the LNER only managed to withdraw three D40s before Nationalisation (1948). At this time, large numbers of Thompson B1 4-6-0s were being introduced, and British Railways quickly withdrew the remaining eighteen D40s between February 1953 and June 1958. Final allocations were usually to sub-sheds including Banff and Macduff. The last locomotive to be withdrawn was No. 62277 Gordon Highlander from the Speyside line. It was used for steam excursions until June 1966 when it was placed in the Glasgow Transport Museum. Although this was one of the later superheated batch, it was painted in the pre-Heywood GNSR livery and renumbered as GNSR No. 49. Heating Surface: Total: 1172.5 sq.ft. 1000 sq.ft. Firebox: 113.5 sq.ft. 106 sq.ft. Grate Area: 18.2 sq.ft. 18.2 sq.ft. D40 No. 62277 Gordon Highlander was withdrawn from service in July 1958. It was renumbered as GNSR No. 49 and painted in the GNSR's pre-Heywood green livery before running a variety of steam specials and special workings. No. 49 never actually carried the GNSR green livery in normal service, as it was built in 1920 - after Heywood introduced his black livery. It has now been preserved by the Glasgow Museum of Transport in non running condition, and continues to be exhibited as GNSR No. 49. The GNSR generally did not name its locomotives and Pickersgill actively removed the names from many engines. However, Heywood re-introduced the policy with the 1920 and 1921 batches of D40s. In total, eight of the twenty one D40s received names.